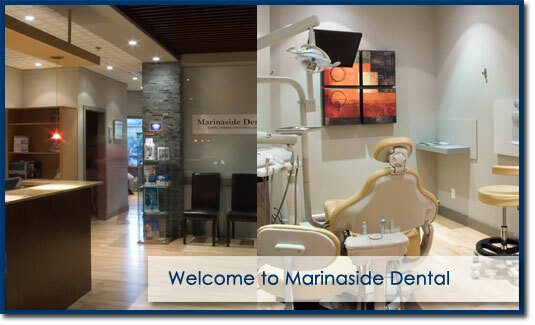 Dr. Kim Kent and her staff welcome you to Marinaside Dental, situated in the heart of Yaletown. Through extensive and thorough examination, Dr. Kent will determine all your dental needs. Our philosophy is to inform and educate you on your dental health, and take the time to explain and discuss all your options to assist you in determining any required dental treatment. We provide a broad range of dental services including: veneers, lumineers, white fillings, crowns, bridges, implant crowns, root canals, extractions, invisalign orthodontics (no brackets), TMJ therapy and preventive services (hygiene), in-off and take home bleaching, and digital radiographs. We are confident that you will find our office environment a professional and relaxed one. We pride ourselves in meeting and going beyond your expectations to provide you with quality care, a beautiful and healthy smile, comfort and timely service.